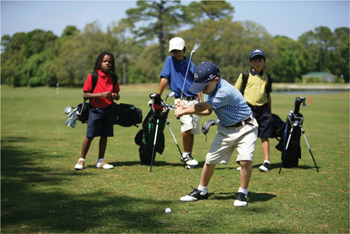 Below is a list of the "Top 10 Reasons Kids Should Play Golf" as recommended by the Player Development Committee of the PGA of America - a group dedicated to introducing the game to people of all abilities and backgrounds. Develop Life Long Benefits: Benefits of golf include making life-long friends and learning a game that can be played. Spend Quality Time with Family: Golf can be an event around which all family members can gather for several hours. It is a great opportunity for parents to provide positive feedback and encouragement to children. Spending Time Outdoors: Walking and being active in the outdoors allows for breathing in fresh air and establishes healthy exercise habits, far beyond indoor video games or television. Business Skills: In addition to etiquette and the ability to play comfortably with new acquaintances, golf teaches self-confidence, improves the ability to work with numbers, and applies problem solving skills that are critical in business. Anyone Can Play: Men, women, children, people from all over the globe and all walks of life come together on a golf course. The diversity found on a golf course opens young golfers to a broader view of the world and all people. Self-Improvement: Golf challenges the player toward constant self-improvement. Players analyze what they did well and what has to change to improve. Players develop habits of self-improvement by self-analysis skills, seeking professional instruction, and accepting critiques from others. Etiquette and Values: Golf has a rich tradition of etiquette which lives on today. Playing golf teaches youth how to behave towards self and others, and imparts values such as truthfulness and strength during adversity. Health: Golf is an active game and is less injury prone than contact sports. Conditioning for golf improves strength of core muscles that support the spine, improves flexibility, and allows participants the opportunity to be active and fit. Controlling Emotions: In golf as in life, there are achievements and disappointments. Learning from mistakes and overcoming obstacles improves a player’s game, and teaches them to optimistically carry out the same pattern in day to day life. Fun: Young people grow up too quickly in today’s busy, technological world. Gathering with friends to play golf gives young golfers the opportunity to spend enjoyable times in friendly competition or collegial companionship.